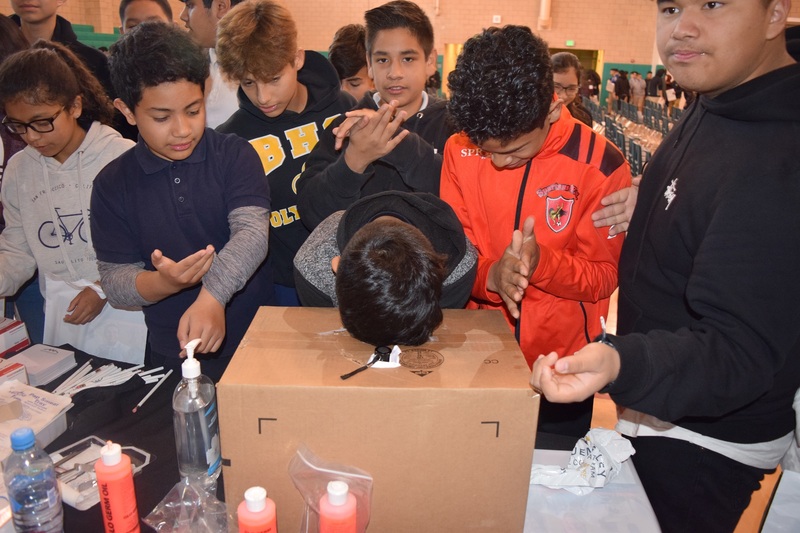 LA PUENTE, CA – Bassett Unified eighth-grade students slathered their hands with hand sanitizer before placing them inside a cardboard box. The students then peeked inside the box from an opening on the top and saw a special light illuminating the lingering germs on their palms and under their fingernails. The demonstration was presented by Bassett High’s Health Academy as part of a three-day career and technical education showcase that introduced Edgewood Academy, and Torch Middle and Bassett High school students to pathways in health care, business, engineering and education at the high school. Edgewood and Torch eighth-graders learned from high school administrators and teachers that they have more choice over their classes and extracurricular activities. They also learned the important role high school guidance counselors will play over their next four years. 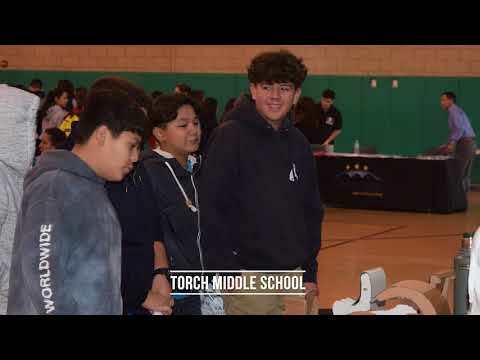 “We want our middle school students to have an opportunity to meet the teachers and students who are driving our pathways and give them a preview of what will be waiting for them when they enter high school,” said Linda Bermudez, Bassett Unified’s director of compliance, policy and business partnerships. Bassett High underclassmen were encouraged to explore CTE and visual and performing arts (VAPA) classes, while receiving guidance on the academics, life, employability and technical skills needed to pursue their dream job. A Regional Occupation Program presentation detailed how jobs increasingly require a combination of academic knowledge and technical skills. All career pathways were tied to a specific outcome: employment, certification or completion of University of California and Cal State admission requirements. 032218_BASSETT_CTESHOWCASE1: Torch Middle School students peer through a specially lit cardboard box that illuminates germs on their skin even after using hand sanitizer. Bassett Unified students attended showcases that highlighted career pathways and extracurricular activities available at Bassett High. 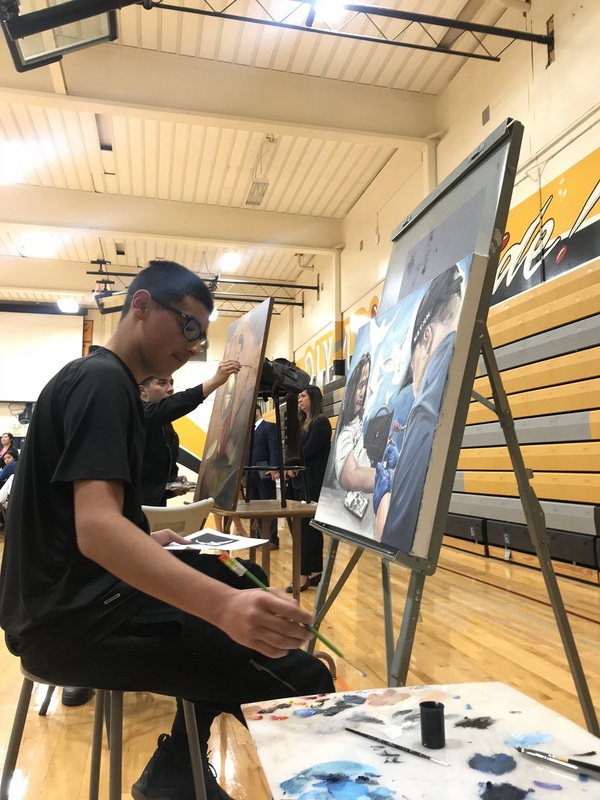 032218_BASSETT_CTESHOWCASE2: A Bassett High art student paints on a canvas in front of his peers, showcasing the skills and techniques he’s learned through the school’s visual and performing arts pathway. A Bassett High art student paints on a canvas in front of his peers, showcasing the skills and techniques he’s learned through the school’s visual and performing arts pathway. Torch Middle School students peer through a specially lit cardboard box that illuminates germs on their skin even after using hand sanitizer. Bassett Unified students attended showcases that highlighted career pathways and extracurricular activities available at Bassett High.